No guns. No cops. No killing the other patients. Surprising everyone during last night's The Walking Dead Season 8 finale, a first-ever teaser trailer was unexpectedly dropped for Hotel Artemis. And it looked like an intriguing bit of fun. The chaos and mayhem shown didn't quite add up or make sense. Though it came with the promise of the full trailer today. It's arrived, and this looks like a blast. It's time to check in to Hotel Artemis with the brand new trailer. Set in riot-torn, near-future Los Angeles, Hotel Artemis is an original, high-octane action-thriller starring Jodie Foster as The Nurse, who runs a secret, members-only hospital for criminals. Jodie Foster is joined by an all-star cast that includes Sterling K. Brown, Sofia Boutella, Jeff Goldblum, Brian Tyree Henry, Jenny Slate, Zachary Quinto, Charlie Day, and Dave Bautista. The movie hits theaters June 8, 2018! Jodie Foster stars as "Nurse", with Sterling K. Brown playing "Waikiki", Sofia Boutella as "Nice", Jeff Goldblum as "The Wolf King/Niagara", Brian Tyree Henry as "Honolulu", Jenny Slate as "Morgan", Zachary Quinto as "Ilya". The cast is rounded out by Charlie Day as "Acapulco" and Dave Bautista as "Everest". From the footage, this very much looks like it could fit perfectly into the world of John Wick, and who knows, maybe there will be a crossover some day. Drew Pearce wrote and directed this unique take on the seedy underbelly of crime. Drew Pearce marks his feature directorial debut with Hotel Artemis. On the directing side, he's known for helming the Marvel One-Shot All Hail the King, which starred Ben Kingsley as Trevor Slattery, and tied into Iron Man 3. He has also directed some short films and music videos. On the writing side, he penned the screenplay for Iron Man 3, and most recently worked on Mission: Impossible - Rogue Nation. He is currently penning an untitled Ghostbusters project, and has been hired by Team Downey to work on the Sherlock Holmes 3 script. He also did the screenplay for The Billion Brick Race. Hotel Artemis is Produced by Marc Platt, Adam Siegel, and Stephen Cornwell. The movie is being released in the States by Lionsgate, which owns Summit Entertainment, home to John Wick, so a surprise tie-in wouldn't be out of the question and is very possible. The Hotel Artemis bares more than just a passing resemblance to that franchise's The Continental Hotel, which is also a safe haven for criminals. Lionsgate is currently turning The Continental into a TV series. Hotel Artemis is cool in that it ushers Jodie Foster back to the big screen after a five year hiatus from acting. She last appeared alongside Matt Damon in director Neill Blomkamp's Elysium. She's kept busy behind the camera, so she wasn't really taking a break from the industry by any means. She directed two stand-out episodes of Orange is the New Black, as well as the critically acclaimed Arkangel episode of Black Mirror which had its premiere in 2017. She also directed the George Clooney thriller Money Monster and has been working on the TV movie Charlie. She is also executive producing the documentary Be Natural: The Untold Story of Alice Guy-Blaché. Though, it's exciting to see her finally get in front of the camera doing what she arguably does best. Hold onto your belt loops, this is going to be one wicked ride. 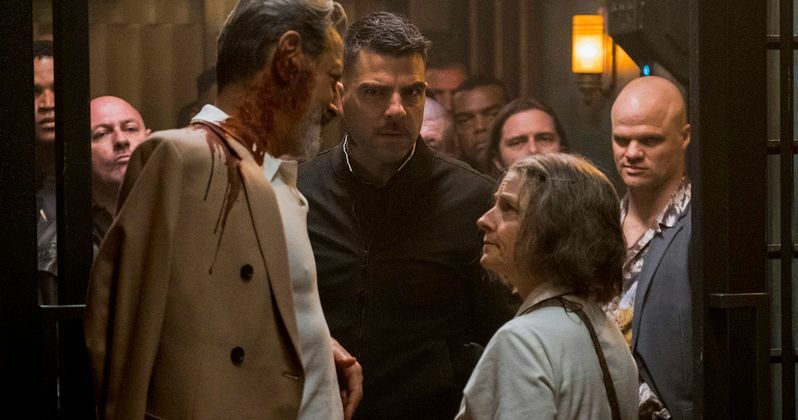 You can check out all the carnage and action of Hotel Artemis in the trailer below thanks to Lionsgate.